Though most cinephiles have long acknowledged southern India’s influential cinematic presence and increasingly high-profile production budgets, values, and box office, much of the outside world and even much of mainstream India never gave the non-Mumbai/non-Hindi industries the time of day, let alone expected anything like this. When I first watched the fantastic trailer for writer-director S.S. Rajamouli’s Baahubali earlier this spring, I was impressed by the scale, scope, and alleged record-breaking budget of the feature; the narrative is stretched across two, 2.5 hour installments budgeted at $40 million in total, and tells the epic, Lord of the Rings (2001-2003) or Gladiator (2000)-sized tale (depending on your preference) of a reincarnated prince who, naturally, fulfills big destinies and saves his birthright kingdom from an evil usurper. Though this first Baahubali installment features plenty of standard Indian cinematic trademarks for both good and ill (a long running time, over-the-top melodrama, a brilliant color scheme, and fantastic music), what sets it apart from most mainstream Hindi blockbusters as well as its South Indian brethren are the effectiveness of its action scenes, the prevalence of its digital effects, and overall solid storytelling and characterizations. Let’s cover these one at a time, shall we? The waterfalls are big, the women are beautiful, and the emotions are exuberant. Embrace the fantasy. First, the action sequences, when they stay relatively grounded and the camera avoids pulling back to reveal inconsistent CGI, are shockingly well done. Action scenes in Indian cinema, be they from Bollywood or wherever else, are typically terrible, but with recent successful films like Haider (2014), certain filmmakers seem to finally be taking them more seriously. This trend continues with Baahubali, where over-the-top slow-motion and gratuitous gore-effects work for the violence, rather than against it. Again, one needs to keep in mind that this story is more about fantasy and mythology than any sort of heightened realism or historical drama — think more 300 (2007) and less Rome (2007-2008) — but with that in mind, Rajamouli picks a tone and appropriate visual style and sticks to it, thank God, rather than chopping up all sorts of genres into a single hodgepodge of mass-audience pandering drivel. Secondly, the film’s much ballyhooed and assuredly expensive digital effects are the biggest mixed-bag of the whole experience. There is no doubt that a film of this size requires a good amount of digital enhancement, and in many respects Baahubali draws much of its style and swagger from memorable CGI, but in just as many instances the overuse of the technology threatens to drag down the fun. Big, on-the-nose sequences like a ludicrous avalanche scene, a silly horse-drawn mecha-scythe machine in the finale, and even little effects like actress Ramya Krishnan holding a CGI baby above her head while standing in CGI water beg the question as to why simpler and assuredly cheaper practical options were not considered. Numerous parts of several action scenes, some minor while others major, are hindered by distracting and totally unnecessary digital effects. To be sure, Baahubali’s techno-wizardry is a far cry from the silly escapades of Aamir Khan in Dhoom 3 (2013), but it’s still a far cry from Hollywood’s best. More and more Indian blockbusters are openly attempting to mimic Hollywood action franchises, but in doing so they are making all the same mistakes that overeager American tentpole features made in the early 2000’s. Back to the good stuff: Baahubali ultimately succeeds on the good ole’ fashioned basics of screenwriting and effective storytelling. Even with its more-than-competent action and terrific music, Baahubali would’ve been a bloated disaster if not for its solid characters and shockingly well paced narrative. 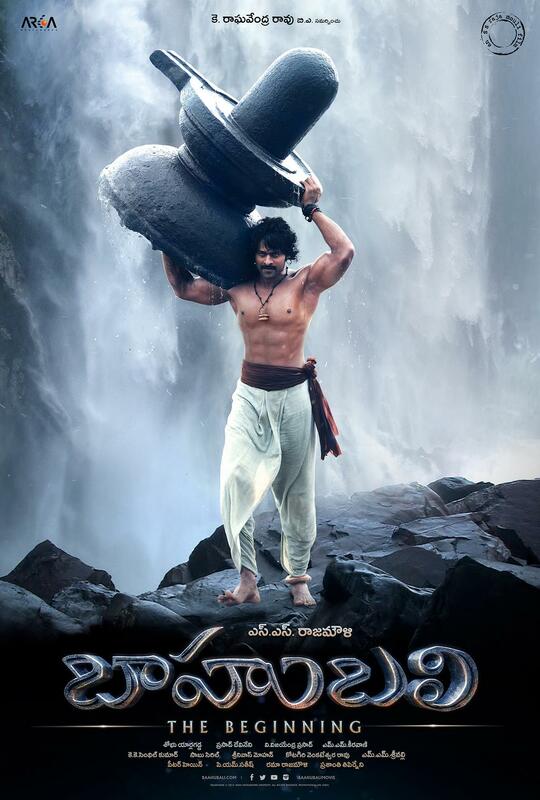 For one, Baahubali’s title character (Prabhas) and his supporting cast, including but not limited to the aforementioned Krishnan, Tamannaah, Rana Daggubati, and Sathyaraj, are all great; heroes are heroes and villains are villains, everyone’s motivations and character traits are crystal clear, and nobody feels like a robot or cartoon caricature (the latter especially notable for a big budget Indian production). What’s more, Baahubali manages to justify its massive length and two-part division through epic scale and great pacing. The story unfolds confidently at its own pace, but nothing ever drags. Some of this is due to the frequency and quality of the musical numbers and action scenes, but much of the effective pacing simply derives from a good story. Baahubali is a genuinely good yarn and boasts great melodrama and political intrigue. It’s not quite pure cinematic drama like a Mughal-e-Azam (1960) or a Haider, but it’s up there as far as high-concept blockbusters are concerned. Only the man with the mightiest can of whoopass will be crowned king. Lastly and what should come as no surprise at all, Baahubali has one of the best musical scores in years. Both its lyrical numbers and its background score are fantastic, so fantastic that I wish theatrical Indian releases wouldn’t blast their sound so loud that I had to partially cover my ears throughout the entire showtime (I’m not kidding). Baahubali boasts the musical potency and theatricality of a rock concert, thunderous and rousing during its most action-packed moments while soft, soothing, and melodic during its quieter ones. Visually speaking, the diverse musical numbers are perfectly choreographed to their tracks and shot such a way that every riff, chorus, hook, and verse reverberates with emotion and sensuality. You should nab the soundtrack right this minute! Why the hell aren’t these numbers on YouTube? SUMMARY & RECOMMENDATION: Baahubali comes down to the story, the emotions, and the characters when all is said and done. It has all three and therefore it works. Rajamouli knows how to shoot an action-scene, at least when the computers don’t get in the way. M.M. Keeravani and his various collaborating artists have musical soul for days, both in the eye-catching dance numbers and in the background score. — However… though much of the digital trickery is necessary and even quite competent at times, much of it isn’t at all and just repeatedly, consistently, without fail takes away from the solid fantasy-adventure at this movie’s core.
? Does anyone else find it amusing how here, at last, comes a major Indian smash-hit featuring stars who actually look South Asian, yet even in this film the idealized heroes are fairer skinned compared to their supporting characters, as well as their barbarous enemies whom are painted charcoal-black?